You will earn 1,408.05 Reward Points. Earn 1 reward point for every 1 dollar spent. Wells HD Gas Countertop Griddles are a perfect match with the Wells HD Gas Hot Plates and HD Gas Char Broilers. The HDG and HDTG Series griddles are extra heavy-duty and feature a ¾” griddle plate for quick pre-heat, even heat distribution and fast recovery. Manual control models features operator adjustable infinite heat adjustment and on/off control while the thermostatically control models provide precise operator controlled temperatures from 200° - 450°F (93°- 232° C). Each control features an adjustable air shutter to control air and optimize combustion. 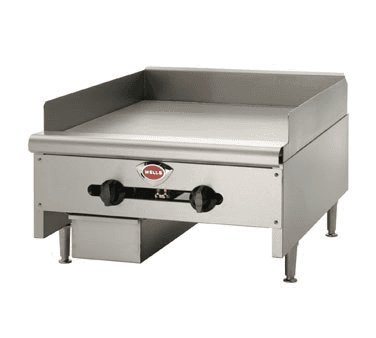 Additional specifications include removable stainless steel front panel for easy access to components, stainless steel side panels, stainless splash guard, full-width, front mounted grease trough, removable large capacity drip pan for ease of clean-up and adjustable 4” heavy-duty steel legs. HD Gas Griddles ship natural gas and are field convertible to LP Gas – conversion kit included.